and I woke up sweaty and frantic, clasping at consciousness with relief as I realised that the Awful Thing had only happened in my sleep. I dreamt that somebody stole my shoes. 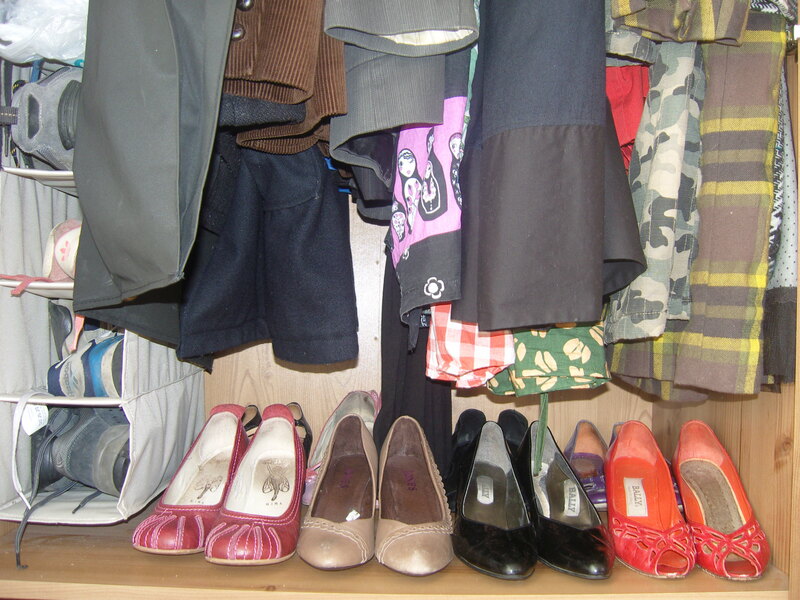 In the dream, I went to my wardrobe and found that the shoe shelves (there’s another beneath the one in the picture) were bare. I headed outside and found myself following a woman who was wearing my red peep-toe sandals (front row, far right, made by Bally, bought for £2.50 in a charity shop). I yearned impotently for my shoes but had no way to recover them. My shoeless agonies became unbearable and I woke up. I’m willing to concede that there’s probably something wrong with me if my psyche’s go-to image for an anxiety dream is the shoe collection. But I was still pretty happy to find them all nestled in their right place.